Pre-Verbal Painting is the first﻿ Midwestern solo museum exhibition of Israeli-born, Los Angeles-based artist Liat Yossifor—featuring all new work made specifically for CAM. Visually recalling the aesthetics of cave painting and the child-like act of finger painting, Yossifor’s work is abstract, yet viewers may discern recognizable symbols within it. Her gestural approach produces an impasto surface that records her physical act of art-making. The artist first applies thick layers of oil paint in various colors, including burnt sienna, green, blue, and yellow, onto a white painted background, then uses her body to vigorously mix and sculpt the material until the once-vibrant pigments meld into a rich gray tone. 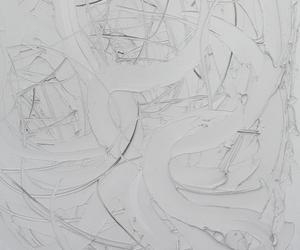 Manipulating the surface as if a sculptural medium, she scores, incises, and smudges the paint with her hands and the handles of paintbrushes. Yossifor has three days to complete the painting before the material hardens beyond a workable state. The resulting compositions are based solely on the artist’s physical, ritualistic, and trance-like interaction with the paint, furthering an approach pioneered by the action painters of the 1950s. Yossifor’s work is at once temporal, pictographic, and pre-verbal, reflecting the artist’s desire to access an innate and automatic creative state. While her paintings border on the monochromatic, subtle traces of primary color reveal the laborious and experimental process behind each one. Through this practice, Yossifor attempts to create a visual record of the cathartic act of expression. Liat Yossifor (b. 1974, Israel) lives and works in Los Angeles. She has exhibited widely, both nationally and internationally. Solo exhibitions include Liat Yossifor: Thought Patterns at Amerigner McEnery Yohe, New York (2012); Liat Yossifor: Falling into Ends at Galerie Anita Beckers, Frankfurt, Germany (2010) and Liat Yossifor: The Tender Among Us at the Pomona College Museum of Art, Los Angeles (2007). Group exhibitions include Stolen Gestures at Kunsthaus Nuremberg, Nuremberg, Germany (2013) and A Reflected Gaze, Torrance Art Museums, Torrance, California (2010). Liat Yossifor: Pre-Verbal Painting is organized for the Contemporary Art Museum St. Louis ﻿by Jeffrey Uslip, Chief Curator.